Star anise has to be one of the most attractive looking spices around. Its eight-pointed star shaped structure contains seeds that that are responsible for its notable aniseed flavour. 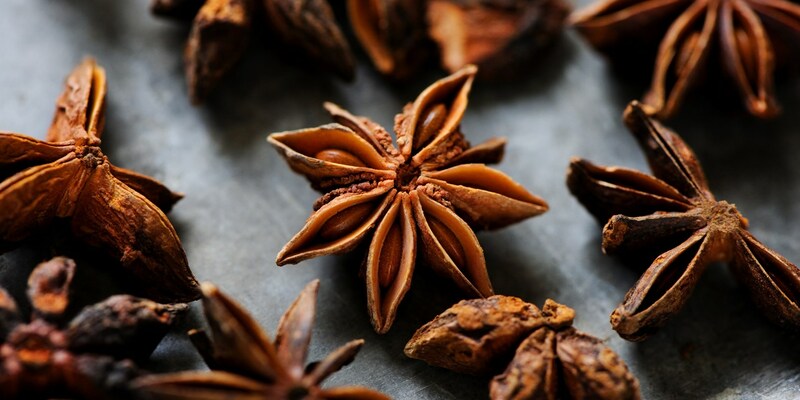 Star anise recipes are common in Chinese and Vietnamese cuisine where the spice is used to impart a warm, aromatic flavour. Slightly smoky, this flavour is especially good with meats like pork belly and lamb, but it also works well in dessert recipes. Native to Southern China, star anise is one of the spices used in Chinese five spice powder and also forms the basis for many Asian soups and stews. You can find it in Geoffrey Smeddle's Vietnamese pho recipe, as well as Marcus Wareing's Asian hotpot. In Alfred Prasad's Peshwari lamb kebabs, star anise combines with fennel and paprika to spice up lamb chops. You'll also find star anise used in the poaching liquid of Tom Aikins' poached salmon recipe. Star anise recipes also include some fabulous desserts, where its warm, spicy punch pairs magically with certain fruits. Pear is an apt example, as in Laurie Gear's poached pears recipe, served with a caramelised white chocolate galette. You can also find them in Luke Holder's spiced wild plums, where the warm spicy plums find balance with a rich, zingy orange sorbet.